Here's a crowd pleasing dip to serve at your next party...it has all the great flavors of pizza easily made into a hot and cheesy dip. What could be better? Spread the ricotta cheese in an even layer in a 9-inch pie plate. 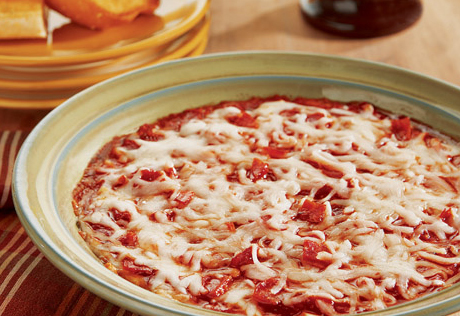 Top with 1/4 cup of the pepperoni and 1/2 cup mozzarella cheese. Carefully spread the sauce over the cheese. Sprinkle with the remaining pepperoni and mozzarella cheese. Bake for 15 minutes or until it's hot. Let stand for 5 minutes. Serve with the garlic bread or crackers for dipping.